After meeting your guide at Kuhio Beach Banyan Tree Waikiki Beach at 8am, get fit for your bike and receive safety instruction. Begin the tour with a roll into Kapiolani Park to discover its history then we head down to the WWI Natatorium Memorial to see where famed Duke Kahanamoku and others trained for the Olympics. You’ll get to visit a secluded green sand beach at the base of Diamond Head, see the Disney house and roll past other homes from the marvels of wealth. Afterwards, pedal up 150 feet to the Diamond Head Light House Lookout. From this advantageous view, you can see surfers enjoying the placid waters of Paradise. Continue the ride on to visit Doris Duke’s Shangri-La located in the wealthy Black Point neighborhood. After a short climb, arrive at the Hawaii FIVE-O studios where they film this ongoing series. Next, head into Diamond Head Crater and park the bikes and embark on a 45-minute to 1 hour hike filled with lots of Hawaiian and WWII history. Along the way, you’ll experience incredible views of Oahu’s south and east facing shores. After the hike and photo-taking, you'll move down to savor a complimentary and healthy local lunch. This is followed by a visit to Lawson’s Station in Waikiki for a sweet “Dole Whip” soft serve ice cream. 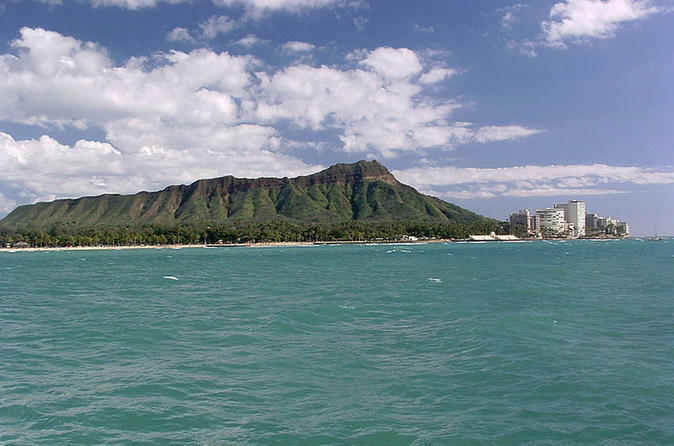 Please note: this tour has hilly terrain and includes a walking hike to the top of Diamond Head. Recommended for more advanced riders/adventure seekers. Ride is between 9 and 12 Miles and will take approximately 3 to 4 hours.